"Unique software with excellent slot games." 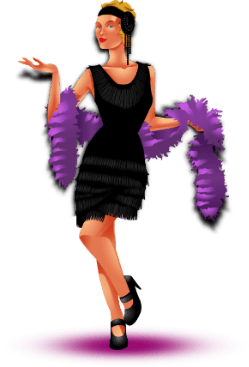 Dark purple and gold dominates the theme of Miami Club Casino, an online casino that takes the fun and party of the famous city of Miami into your home. Established in 2012, the casino is operated by Deckmedia N.V. and it is powered by Wager Gaming Technology online casino software. Miami Club Casino is registered under the jurisdiction of Curaçao. Miami is the city of nightlife, party, dancing and drinking. The casino takes things to another level and it offers the continental flavor gamblers are looking for, not only after midnight, but 24/7. Online casino players, especially high rollers, will enjoy luxury gaming and premium bonuses while playing their favorite slots. Therefore, move from the dance clubs in Miami and try your luck at Miami Club Casino. The casino allows players from the United States as well as online gaming fans from around the world. Miami Club Casino runs on the Wager Gaming Technology (formerly Vegas Technology) online casino software platform. The casino can either be downloaded on a computer or the casino games can be played directly from a browser. The downloadable library is very wide compared to the instant play flash version and it is easy and fast to download and install. The instant play casino games are also fast to load. Miami Club Casino offers over 150 games to choose from. On top of that, the premium and high limit games like slots in particular which are designed with the high roller players in mind, deliver high entertainment value. The software of Miami Club Casino is very fast and the graphics and sounds of the casino games are true-to-life. 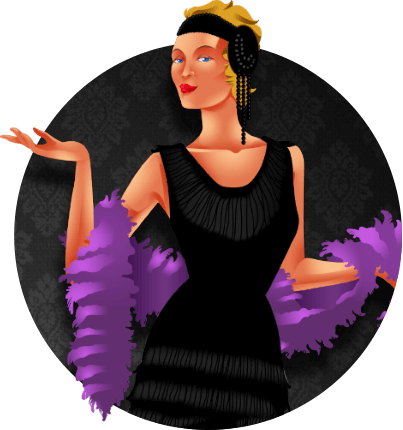 All of the games are animated nicely and designed to deliver the best possible online casino gaming experience. From classic and video slots, to table games, video poker, specialty games and even slot tournaments, the online casino games offer high- end gaming environment. 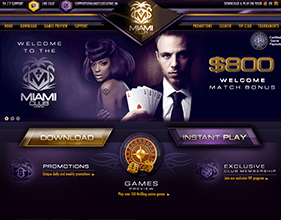 Miami Club Casino is dedicated to provide luxury gaming for premium players in particular. Therefore, there are a lot of high limit games to suit the tastes of these players. We recommend the following high limit slots: Hot Roller, California Gold, Fire Hawk and Big Foot. In addition, we suggest testing your luck in the table games of chance like roulette and the skill games like blackjack and baccarat. Hot Roller is a 5 reel, 25 pay-line slot. The minimum bet is 0.25, while the maximum bet is $250. The game features wild and scatter symbols, a multiplier and a free games bonus feature which uses a mini game of craps to figure out how many free spins you will win. The maximum jackpot of the slot is 600,000. California Gold is a 5 reel, 25 pay-line video slot. The game features people over rushed to find their fortune in the Californian gold mines. Bets start as low as 0.25 up to $250. The game comes with wild and scatter symbols, free spins, a multiplier and a maximum jackpot of 600,000. Set in the Native American landscape, Fire Hawk is a 5 reel, 25 pay-lines video slot that celebrates the awe and mystery of nature. The betting range starts as little as 0.25, while the maximum bet is $250. The maximum jackpot is 600,000. The slot features wild and scatter symbols and a free games feature with a multiplier. Big Foot has alluded man for decades and there have been many searching expeditions in the Northern regions of America to find creature also known as Sasquatch. Now it has joined the world of online casino gambling in form of 5 reel, 25 pay-line video slot. The minimum bet is 0.25 up to $250. The game comes with wild and scatter symbols, free spins and a maximum jackpot win of 500,000. Besides the high limit slots, the players who want to deposit and play big can hit the tables at Roulette, Blackjack and Baccarat. There are two roulette variants available- American and European roulette and there are a total of four blackjack variants. Among them is the popular Progressive Blackjack. Slot junkies can take advantage of the $800 slots bonus available on their first eight deposits up to $100 FREE. At Miami Club Casino players can also claim 100% first deposit bonus up to $100. There is also $10,000 prize pool on slot tournaments with no particular fees to enter. The casino also offers many daily, weekly and monthly bonuses and promotional offers, so check the Promotions page to find out more. Once you make your first deposit, you will immediately start earning comp points and the more you deposit and play the higher VIP rank you will get. There are six VIP ranks and as a new customer you will start out your journey as a Flamingo. The higher the VIP rank, the bigger comp points percentage you will receive. Some of the benefits you can take advantage are weekly loyalty bonuses and exclusive deposit bonuses. Miami Club Casino has done its best to protect its players and their money and the safety and security of its players is top priority. The casino uses the 128-bit SSL encryption to protect the player’s sensitive data such as personal and/or financial details as well as all banking transactions. There are also additional advanced billing techniques to protect the credit card information players provide. The casino is also certified for fair gaming and its games are truly random. Regarding its customer support service, if you have any problem, question about a bonus or a game or simply want to give your feedback, you can reach a representative 24/7 through a number of different methods. For instance, if you have any immediate question, you can contact the casino’s customer support team though live chat. You can also reach them through e-mail and phone number. The team is fast, very helpful, polite and well mannered. Miami Club Casino is powered by Wager Gaming Technology software which means that it offers a different streak of casino games compared to the online casinos powered by Microgaming or RTG. There is a large range of slots and table games and the quality of the games is at its best. The slot games are most suitable for high rollers who want to play big and hit the Big One. The fact that it accepts players from the US is also great. The casino also offers a number of different deposit and withdraw methods and it is secured with SSL encryption. Last but not least, there is 24/7 support available through live chat, e-mail and phone.